Arc-Zone’s very own Joanie Butler has been selected to participate in The Arc-Zone Pro Partnership program. A little over three years ago, Joanie’s adventure with Arc-Zone began. 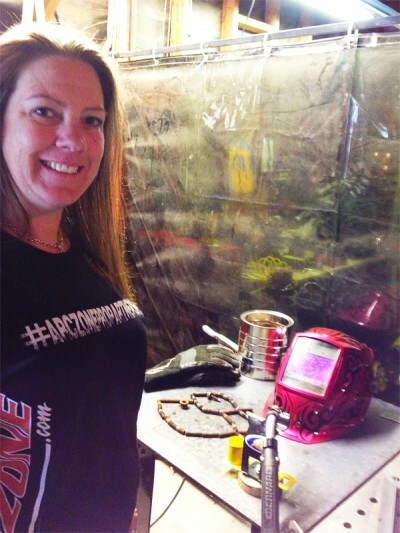 She has proven to be a Jill of all trades who assists our Customer Care, Marketing, and Purchasing Teams; she creates metal art as a hobby, and even single-handedly designed and built a one-of-a-kind sign for Arc-Zone’s Ultimate Showroom. She’s an inspiration to female fabricators everywhere and was recently hand-selected by the AWS to serve on a National Committee to create a Program for the Girl Scouts of America. Without further ado, Arc-Zone proudly presents to you, Joanie Butler! Q: How old were you when you first got into welding and what initially sparked your interest? A: I was about 18 years old. I lived in my hometown of Fort Bragg, CA and worked in a small equipment rental company. I waited till everyone left for the day, locked myself in the back of the shop, cranked up the old buzz box, and taught myself how to weld rusty lawn mower blades together. Q: How did you get your training? Educational experience/work experience? A: I took the complete Non-Traditional path, and it definitely wasn’t paved. I cut my teeth in the Automotive industry. My first career was working for a manufacturer of direct fit aftermarket catalytic converters called Miller Catalyzer based out of Hayward, CA. I was barely 21 years old and was offered the opportunity of a lifetime to open and run the San Diego County facility by myself… One of the main reasons I was offered the job was because I could weld. I started off with a sales-based focus, building our clientele. After 3 years, I hired my first helpers and convinced my bosses that if they sent me some tools, I could create a demand for my services. A month later, a Millermatic 251 MIG and a Hypertherm 380 Plasma Cutter with an industrial air compressor and hydraulic bender arrived at the shop. With years of late nights building jigs and stockpiling scrap to both practice on and to create art, my skill sets grew to where they are today. Q: Where do you work now? A: I am currently employed by Arc-Zone.com. I wear many hats at AZ and work through various challenges finding solutions for Metalworkers worldwide. It’s not just selling products, It’s much more than that for me. It’s definitely not just a job; it’s my lifestyle. A: My most favorite part of my job by far is managing the Arc-Zone Pro Partnership. One of my goals in life is to promote what I’m passionate about and connecting with some of the world’s most highly-skilled fabricators on a daily basis is just that. Having the opportunity to help guide and drive the partnership forward with such talent is overwhelmingly rewarding. To be as fortunate as I am to share the foundation and the vision that our CEO of Arc-Zone, Jim Watson, created is out of this world. Without Jim’s deep roots and broad base of experience in the welding industry, there would be serious mass confusion moving the industry forward. Q: What’s the biggest welding challenge you’ve ever faced? A: In my last career, one aspect of my job was designing and manning satellite fabrication facilities for a manufacturer of aftermarket catalytic converters. My duties included traveling the Pacific Northwest and finding both buildings and skilled fabricators to run the facilities. Most of the time, I single handedly ran all aspects of the shops where I provided a same day service for direct fit catalytic converters to local dealerships and auto repair facilities, including pick-up and delivery. The most challenging location was Phoenix, AZ with the extreme high temps in the summer. Q: What’s the most fun you’ve ever had working on a welding project? A: About 2 years ago, I was offered what some would consider the challenge of all challenges. To build a Showroom for metal workers, but with a twist… No peg boards. Jim Watson asked my opinion on signage for inside the showroom in Carlsbad, CA. Most people would suggest a local sign shop that could easily send over a quote… Oh no, I had to make it! 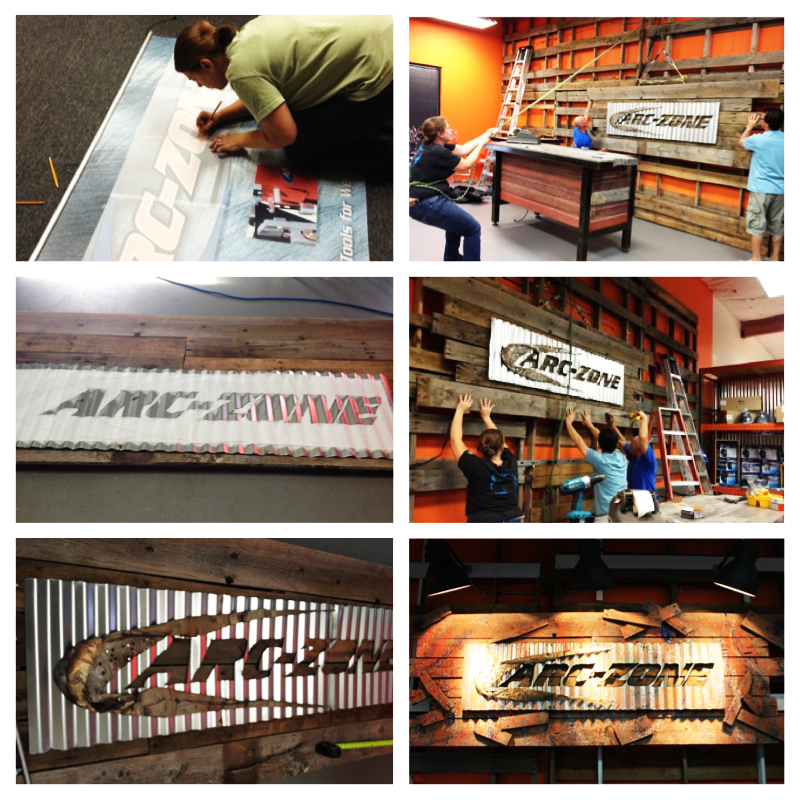 I broke down a 80″x80″ shipping pallet by hand and reused all the wood for Arc-Zone’s Showroom sign. I was also able to create our Pro Solutions Center “canopy” out of recycled automotive and motorcycle parts and pieces. Having the opportunity to create a unique place for all metal workers to embrace our skills and express an appreciation of the trades was very rewarding. Q: What kind of music do you listen to while welding? A: As long as it has a decent beat, I’ll listen to it. My mother is a classically trained pianist, so rhythm, timing, tone and pitch are all a part of my day to day. I associate many different tasks to different genres of music. If I’m in a prep mode with lots of grinding and hammering I’ve gotta have me some heavy metal. If I’m in design or layout mode, reggae or anything that literally makes me smile. Q: And for the most important question…. Tell us what your favorite drink is? A: Being from Northern California, any homemade craft beer has to be my most favorite. If I’m not in the “beer-me” mood I’ll kindly sip on some whiskey, wine or water. It’s all good! Q: Do you have any hobbies on the side? I love to create different types of Metal and found object sculptures, Industrial Art. Painting, Dabbling with Photography. Riding Motorcycles. Restoring my Vintage BMW and anything ocean related, surfing, snorkeling, fishing. Hiking, Camping, Off roading adventures. World Travel, Music and cooking. But my dog, Molly, has to be one of my most favorites; she’s the ultimate shop dog spending many many hours patiently waiting for her time. Q: Where do you see yourself and/or your business in the next ten years? A: Wow, in 10 years I really hope to be creating as much as possible. Using the skills I’ve put quite a bit of time and energy into. One thing I’ve learned is you’re learning every day. If your focus is nothing but perfection, you’re missing the opportunity to grow. I’ve watched some focus so much on being perfect that life just passed them by, and they were miserable. My focus is to maintain happiness because success is always right there with it. Q: Who do you look up to in the industry? A: I look up to people who really put themselves out there, whether it’s a young high school student sharing his or her first weld on social media. To a highly skilled tradesman in Australia who, after brainstorming with some mates on the pipeline, spawned one of social media’s most influential followings in welding history. Uniting Welders Globally… Marcus of @weldporn has sparked a movement that any and all metalworkers should know about really soon, if not already. Q: Last but not least, what advice would you give to folks just starting out? A: You’ve got nothing to lose and everything to gain by trying. If welding has enhanced who I am in any way, it’s taught me patience. 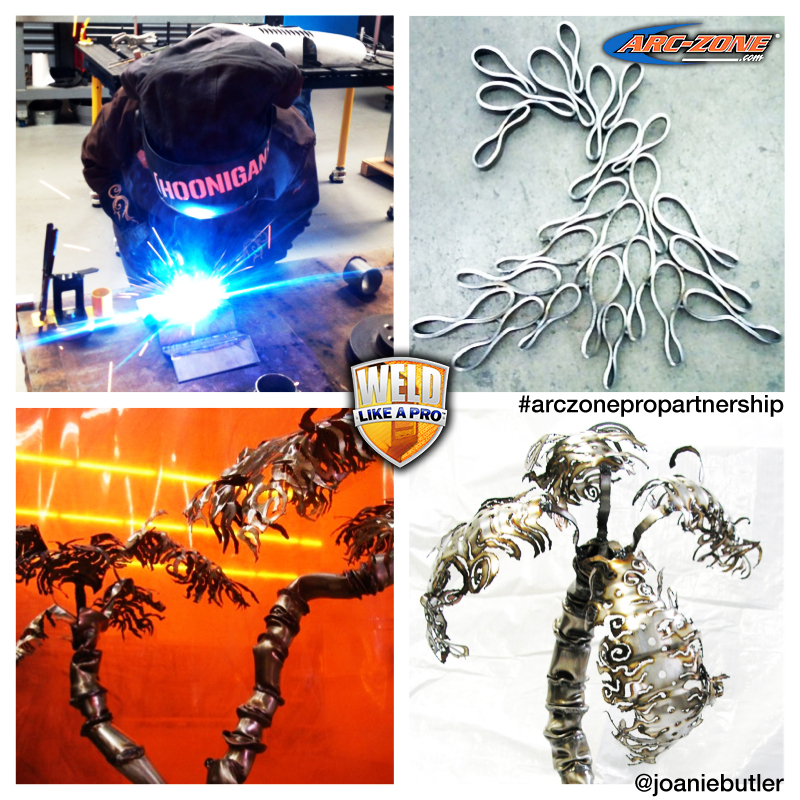 Welding is a perfect blend of art and science. It’s a learning process that is different for everyone, so don’t fill yourself up with frustration by wanting to get better at a quicker pace. Be patient with yourself and try to understand it takes time with that hood down to improve. Seek out a skilled mentor and impress the heck out of them. If you really really want to make it happen, you will. Eat, Sleep, Weld, Repeat! The entire Arc-Zone Team is incredibly excited for our upcoming projects with our Pro Partners, so stay tuned! Be sure to follow the Arc-Zone.com Pro Partnership™ movement on Instagram, Facebook, or Twitter at #arczonepropartnership. If there’s a question we missed that you want to ask Joanie, just comment in the section below! This entry was posted in Arc-Zone.com News, New Rosies, Welding Fun, Working Women & Society on August 15, 2014 by Carmen.